If you’re a long time reader, you already know how much I love LinkedIn. In my opinion, it’s the most useful tool you can have during your job search, when utilized properly of course. I also HEAVILY utilized LinkedIn as a recruiter, scouring the site daily for candidates who fit the requirements of jobs I was hiring for. The one issue with this is that just because someone has a profile on LinkedIn, it doesn’t mean they’re interested in leaving their job. And for those who are interested in leaving, there’s really no way of knowing that since most people job search confidentially. However, this guessing game wasn’t really efficient for either party. A few weeks ago, LinkedIn caught on and introduced a new feature that solved this exact problem. Enter the open candidates feature. Who among us hasn’t, at some point, tried to find work without our boss finding out? 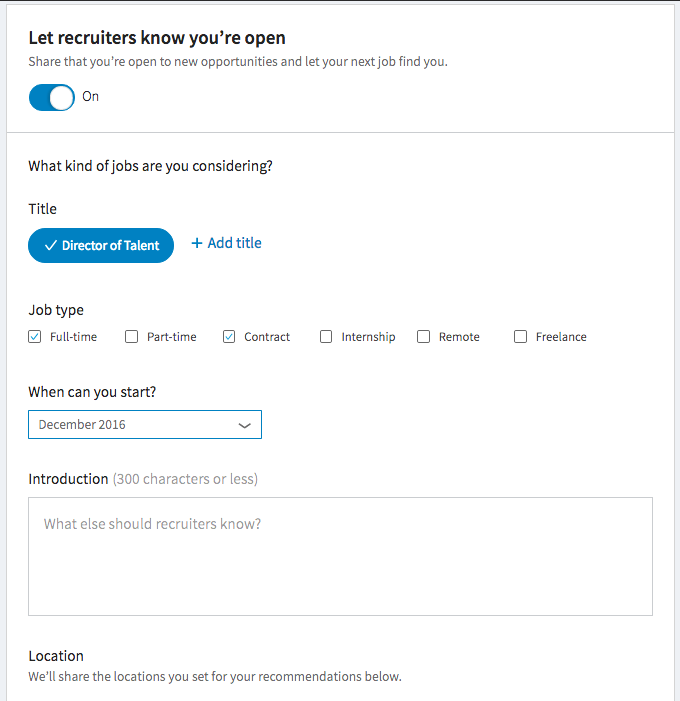 Now, you can privately indicate to recruiters on LinkedIn without worrying. We will hide the Open Candidates signal from recruiters at your company or affiliated company recruiters. This can be super helpful whether you’re simply open to new opportunities or aggressively searching. The system even lets you enter specific job titles so you (theoretically) get contacted for the right stuff. Time will tell how well that works! I’m definitely curious if people will get spammed with jobs that aren’t a fit as well. This feature could be game-changing for people who want to relocate. It allows you to specify when you’d be ready to start and also where you are looking to work, as shown below. Pretty happy where you are but would drop everything to work in fashion? Sick of working at super large companies and want to work in a more casual environment? You can list all of those preferences as well. This is a brand new feature and while I think it’s great, there are a few things to be aware of/watch out for. While the fact that you’re interested in new jobs is hidden from your employer, you can’t guarantee that it definitely won’t get back to them. Especially in tight-knit industries, it is possible for word to travel. By the way, I don’t think this is a huge risk but yes it’s possible. Getting spammed! 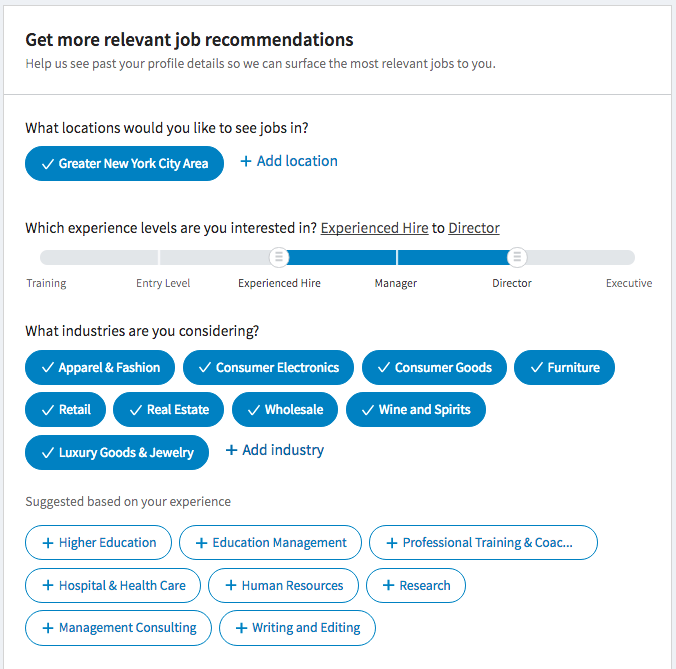 Like I said, I have no idea if toggling this feature on will get you a lot of emails for jobs you’re not interested in. I’d like to think recruiters will be respectful and only reach out to people who are genuinely a good fit for their jobs, but it’s tough to say at the moment. Not all recruiters will have visibility to this. From this post, my understanding is that only recruiters who pay for LinkedIn’s premium recruiter tools will get access. I don’t think that’s going to be a huge issue as so many major companies already subscribe to those tools anyway. However, if you’re looking at smaller startups, this might not be as helpful. I’m pretty excited about this feature and the fact that it will allow people to see what else is out there without much (or any) time or effort. I think this may also allow people to see how marketable they are, which can help with knowing what you’re worth and in future negotiations. It’d be great to do a follow-up post on this, so if you do leverage this feature, I’d love to hear [email me at jaime@prepary.com] about your experiences!